I wasn't planning on doing a giveaway so soon after the one last week, but the opportunity presented itself. And then it inspired a project...sort of. So, another giveaway it is. Before I get to that though, I want to tell you a little about the project and how you might apply it to the giveaway item should you be the winner. Brief digression: I took these shots at a local thrift store that I've mentioned here before, Pieces of the Past. It's on Burnet road, just a bit south of Koenig lane. The place is jam packed with treasures, but don't bump into anything because it's also a house of cards. Anyway, back to the subject at hand, the pillow. The top is made from some charm squares of a stitch in color and a grey cotton. I modified my windows sewing machine cover block from my book to accommodate the larger charm squares. I then quilted the top using squiggly(technical term) lines along the diagonal. I didn't plan this out, but as luck would have it, the diagonal squigglies look remarkably like a miniature version of the windows pattern. Kismet. I crafted a zippered opening using a Denyse Schmidt cotton that she apparently sells at Joann's. Who knew? 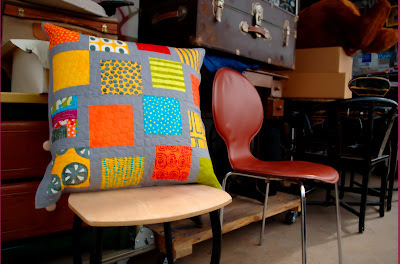 Then I bound the edges as I would a quilt and, voila, fabulous pillow for my sofa. So, are you all assuming that the giveaway item, which, by the way, is being donated by the super-lovely Tammy at Marmalade Fabric, is a charm pack of my a stitch in color collection? Well, if you've made that assumption you're...wrong. The giveaway prize is even better because the fabric pieces are bigger and bigger is always better when you're talking fabric. This, my dear readers, is a layer cake. That means the squares are 10" x 10". If you used the same concept I used on the pillow with these squares, adjusting the size of the solid strips accordingly, you could easily make a large quilt lickety split. You don't have to, of course, but I'm planning to. You want it don't you? Well, then you know what to do. Also, if you're local, please come by Sew Much More on Anderson Lane this Friday from 6-8pm for my reception/book signing celebrating my fabric line as well as my book. I will be there signing and schmoozing and will return the following morning to give a seminar on utilizing color and pattern. AND, I'm not done, if you are on the Austin Marathon/ Half Marathon route this Sunday morning, please come out and cheer for the runners. Believe it or not, we really appreciate it. I'd love to play with this! I just got some yardage in the mail yesterday and the texture of the prints is great. I live on the marathon route... Chauncey and I will be out there cheering! GO RUNNERS! Being in NC, I will have to cheer on the runners from afar. I just finished my first 5K last weekend. I am a novice runner. I would adore a layer cake of your fabrics. Gorgeous fabrics! Would love to make a quilt from these. Unfortunately I cannot cheer you on the run as I live too far away but as I am a runner myself I know how nice it is to have lots of people on the track, especially for the last miles! Thanks for the chance to win, I really love your new fabric line! 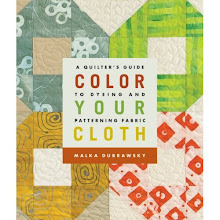 What gorgeous fabric you make, Malka. Best to you as you run thru the prettiest city in Texas, I've been told and believe. I flew over one day low enough to see the huge preponderance of trees; Austin reminded me of my home Berkeley, CA where the trees reach for the sun and some make it !~! oooh looks like a fabulous vintage store! Great photos, and LOVE the pillow! Thanks for such a great giveaway! You are SO right, Maria! A quilt from this layer cake would be wonderful -- and fast. Run like the wind, I'll be thinking of you. Look for my nephew and great-niece! Too much snow and ice for running where I am but lots of time for sewing. Would love some of your fabric. The colors are fantastic. I'd love to win some of your gorgeous fabric! Thanks for the chance to win such wonderful fabric - it would be great to play with. happy running. Thanks for offering another giveaway so soon! The fabric is gorgeous and I'd love to work with it! Good luck to all the runners (I'm too many states away to come to the race). Love your new line, great colors. I used a charm pack to make a stacked coin quilt which was a big hit and similar to your pillow! Thanks for the chance to make a larger one! yum-mee! I'd love to play with your fabrics. good luck in the run! I love your new line Malka! but as I'm in the UK I will cheer you on from here! I've seen a stitch in color in three local stores! I'd love to win this collection! It's so cold and dreary, I would love to win this to brighten up my day! Week! Month! I have yet to lay my hands or eyes on "stitch in color" in person - boy would I love to win this cake! Thanks! We'll be cheering along the runners! My son will be working a water station. Pillow is lovely! Such pretty fabrics! Love the pillow! I would seriously love to have this layer cake !! Oh, I am crossing my fingers to be chosen, as my local shops don't carry anything nearly this modern! And I love this fabric! I'm loving the colors in this line! Hi Malka - I was just drooling over the same layer cake at HoneyBee Quilt Shop but didn't have the money to buy it! So, pick me! When my hubby used to run the Austin marathon, I'd stand on the side of road and hand out orange slices to the runners. It was so fun!! I hope this crazy weather cooperates for the run. really cool layer cake - your stuff is SO INSPIRING!!! Would love to play with them - can't make it to Austin this weekend - but will be cheering the runners in my thoughts!! I'd like to win this because 1) It's gorgeous, and 2) I apparently can't cut anything straight, so some pre-cut squares would be welcome right now! Beautious fabric, I love your choices for patterns and colours. Your fabrics and designs are a blast to work with! Thank you for having a give away and good luck in the run. I'll be cheering the runners on from my couch! What a lovely layer cake, thanks for the chance to win it! Love the pillow and the giveaway....This weekend I'll be cheering you on from NYC! Love the bold colors. I'm sure I'd come up with something awesome to make with this! I saw your fabric at the Attic window Quilt Shop and fell in love with it. I love your bold colors and had to buy something of everything they had in the line. Can't wait to start sewing. I love your colours! I would love to win a layer cake of your fabric. My favourites are the orange/red prints - awesome combo! Thank you for the giveaway! Oooh! Delicious fabric! A layer cake would be a lot of fun and I have a pillow I'd like to make! A Stitch in Color layer cake would be so much fun! I love the great variety of prints you designed. Have a nnice time running and thanks for the chance to win these gorgeous fabrics. I love the fabric in layer cake size. amazing! thanks for another generous giveaway. How fun! I do like fast and easy! Have a great race, I'll be cheering you on from Oregon! This would be great for my first quilt!!! have a great race! Gorgeous, I just love the vibrant colours! Thanks for the giveaway! This is absolutely beautiful! Your work is so bright and inspiring. What a gorgeous layer cake! 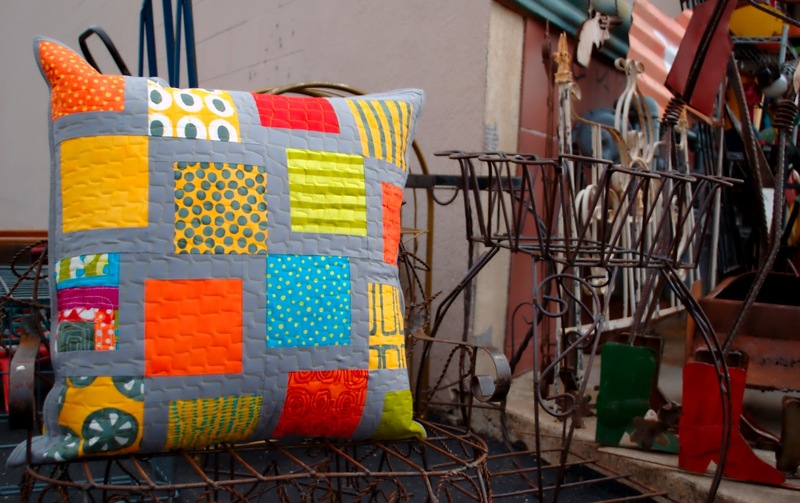 The pillow is adorable and I love the quilting! Would love to create something with these fabrics! Don't usually go for precuts, but can't resist a chance at these lovelies. Thanks! Good luck to all the runners and thanks for a chance to win some of your lovely fabric. Ooooh! Love that pillow! Thanks for the chance! I would love to give this cake a home. Pick me! Thanks for the give away. With fabric , "bigger certainly is better". Thanks Milka and Tammy for the chance in this giveaway. Have some of the line from the local quilt shop - but would love to have more! keawesome~! Good luck on the run! Pick me! Pick me! I love your fabrics! PICK ME PICK ME!!!! and your pillows are GORGEOUS. . . they look so stunning especially in the small preview photo on my blogger dashboard! I love your fabric...ooh a layer cake would be great. Have a wonderful weekend, for it sounds great. Woweee! Still waiting to find this so I would be so very thrilled to win. How wonderful that your fabric is so popular! oh my! i certainly would make a fantastic quilt with this! crossing my fingers! I would LOVE to sew up something FUN with your great CAKE!! I would love to win the layer cake of your fabric. Just started playing with those colors and love them. Good luck runners! 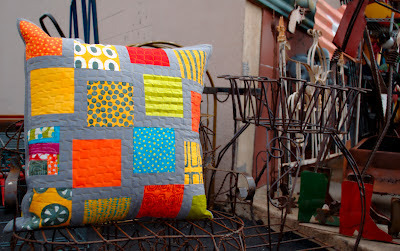 I love the way the blocks in that pillow are staggered! Very eye catching! I would love to win the layer cake, pick me, pick me! Me too, I would love a layer cake of your yummy fabric. Good luck on Sunday! Yay for running :-) My neighbor's running the full, and I'm already so proud of her. Thanks for the head's up about Pieces of the Past. I'm looking to score a mid century modern buffet without breaking the bank. I'll have to check it out! Love the fabric! Thanks for the fun giveaway! And good luck on the marathon!! The only two marathons I've ever run were in Texas....sadly not in Austin however. Maybe I should make Austin's my third??? Thanks for the giveaway. I love your fabric and your pillow. The photo setting is great too. Thank you for this opportunity. You have done so well with your fabrics and books. I love your taste. Love layer cakes-sometimes the charms are just a little too small! But your pillow is gorgeous! i love this line! a layer cake would be wonderful. Oh man, your fabric is the neatest stuff, and I'd totally dig a chance to play with more of it. What a great prize! I hope I'm lucky! Love your work. oh my love these colors!!!!!!!! I've been trying to find some of the fabric in the Des Moines area to no avail. Would love, love, LOVE to be inspired by this beautiful fabric! Wonderful layercake and beautiful pillow...too cute! wow. now that would be a cool quilt! count me in! Pick me! pick me!!! i am in love with this line of fabrics! I have a skirt pattern that requires a layer cake ... would be thrilled to win :) thanks for the chance. Yeah, you know I want it! I love your fabrics! I did find some yardage in Portland a couple of weeks ago, but they only had a few of the fabrics. So, please put me in the drawing too! Thanks for the opportunity! Treat each step you take on your marathon journey on Sunday, as a major success. I hope you achieve your personal best and have a great time with many like minded amazing people, many of which will be raising funds for charities and good causes - blessings to you all. What a fab give away. The winner will be so pleased! Thanks, Malka! I'd love to go in the draw for these gorgeous, vibrant fabrics...I can just imagine whiling away my weekends this coming winter with these stunning brights. Keeping winter at bay. GOOD LUCK in the race. Please enter me into your great giveaway. I have never had a layer cake before. Thanks for the chance. I really like the bright colours of this line. Thanks! Your bright colors look lovely on the grey background :) love it! do I want it? you bet I do! I love your cushion covers too! I would love to make a quilt of these beautiful fabrics! Thanks for the giveaway. That shop looks like a wonderful addition to your neighbourhood - I purchased a charm pack of your new line - but a layer cake would definitely increase the possibilities! Thanks for the opportunity! That is a super cute pillow! I love how you adapted the sewing machine pattern to fit the charms. Great idea! Awesome post!!! keep it up.. please keep us updated with such amazing articles nice blog.. i would be regularly following your blog. Ooooooooo, count me in on the giveaway. Good luck with your run--it must be nice to have roads that aren't snow covered in February! Good luck. Those fabrics look great. I haven't seen them anywhere local yet, and I'm trying to use what I have...but they are tempting,very tempting. Oh I would love to win this! Your fabric line is so fun and vibrant. Thanks for the chance. what a fabulous giveaway! & I love the way the fabrics pop off of the gray solid. Would love to be a winner! I would so love to have this layer cake!! I adore your stuff! Oooh, I'm itching to get my hands on some of your fabric! I loves the colors of the fabrics. So pretty! Oh, the colors are so wonderful. Have a great run on Sunday! Go runners! That would be a real treat!!! The pillow is gorgeous, thanks for the giveaway . The top fabric is printed? it looks like a pillow cover - all quilted. Your fabrics are wonderful and I'd love to make a quilt from them. I would love to win the layer cake! Good luck in your run! Best wishes with the marathon this weekend! 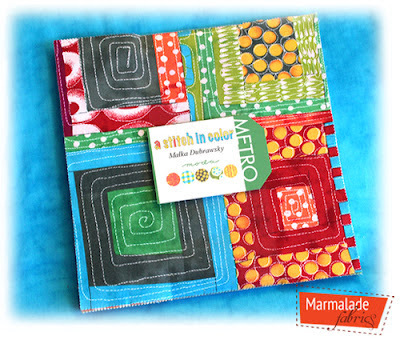 Your fabrics are so gorgeous and Marmalade Fabrics is so generous to be giving us the chance to win some. Thank you both! Wow, what a great giveaway! Thanks for the chance! Your pillow is gorgeous! I totally wish I lived closer! :) The colors are so fun! Thank you! How lovely! Those colors just pop. If I lived closer, I'd come by! Thanks for the giveaway! Oh how I would love to come and meet you in person. Your blog has inspired me to quilt more. I would love to win the layer cake! I need to make a new quilt for my bedroom and your fabrics are beautiful! At a retreat last weekend, on of the quilters had a whole bolt! It was gorgeous! I would live to play with a layer cake! Hi, Malka. Always enjoy dropping by your colorful blog. Your fabric line is lovely as is the gray pillow. A layer cake! Wow what a great prize! Good luck with your run. Thank you for a chance to win and good luck! thank you for the chance to win!, i love this fabric. I would love to have a layer cake of this fabulous fabric - thanks for the opportunity! Good luck with the run, I'll be cheering from afar. The colors are fabulous. I'm a native Texas (Houston), but I live in California now. Thanks for the chance to win. of course, i would not be able to resist making a quilt out of this- just the shot of color i need for the winter greys! I love this colorful line of fabric. What a great opportunity. I love the pillow! And the fabric! Such great colours and patterns, really unique! These are beautiful prints, and Tammy is very generous to be giving them away. Thank you for the chance to win. I wish I lived in Austin - love your city! - because I would sure be at Sew Much More! I love your cushion but I absolutely positively love your fabric even more and want it so badly and by golly by gosh I shall have it one way or another. You are amazingly gifted. Love the fabric! Thanks for the giveaway! thanks for the giveaway tammy and malka! these fabrics are so WOW! I'd love to give the new layer cake a whirl! Love your books and have tried my hand at dyeing fabrics. Thanks for sharing your glorious talents with all of us quilters! I am so looking forward to this collection coming to the UK. If I was there I would definately cheer you on! I love it! I need it! I want it! Thanks for offering such a great giveaway. So pretty. I want a quilt with these fabrics. Would absolutely love the fabric and give it a good home! Thanks for the chance. I have been looking all over for your fabic!!! Would LOVE, LOVE, LOVE to be the winner of this layer cake!!! I love this fabric line, so thanks for the opportunity to win the layer cake! I just love the bright colors! Count me in! 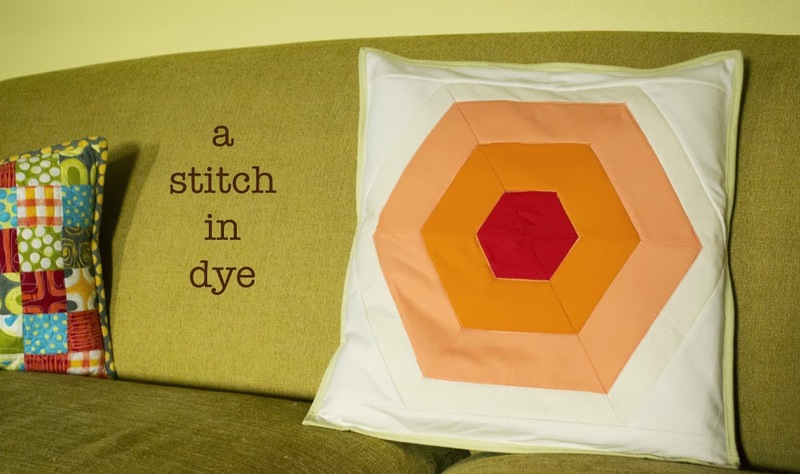 Wow, a quilt looks like the best possible way to use such amazing colours. Well, that our a skirt. Good r job. Ooo, wish I was local. I love me a good marathon. My daughter ran twice in the NYC marathon and once in the Denver Rock 'N Roll marathon. Really wish I was there. Here's hoping all the runners finish and beat their last time. Also, the pillow is to die for!!! Love it. I want it, I want it, I want it!!! It is so yummy looking and I love the colors. Thanks for the chance at a giveaway. Wow a layer cake! Luv the colors! Your colors make me so happy. They remind me of my trip to India. Wishing for balmy weather and a good turn out for all the runners. love the pillow and would LOVE to win a layer cake of your gorgeous fabric - I'd make something out of your fresh quilting book I got a few weeks ago :) that thrift store looks fabulous as well - pity I'm in australia ! I would love this layer cake!! Good luck with the marathon! Love this fabric collection and would love to win. Thanks fro creating these pretties and thanks to you and Tammy for the giveaway. Have a great race! Oh the projects I could make from that! ooh, a quilt sounds lovely. Nice fabric line. Thanks for the chance to win. It would be a dream come true to win this package! I LOVE your pillow!! I really want to make a quilt with this fabric. My fingers are crossed. Wish I could be in Austin tonight and on Sunday to cheer you on. Go, Malka! Oh, what a lovely giveaway. I agree that a quilt would be perfect. I have a stack of your charm packs waiting to be made into a colourful quilt...just trying to decide which solid to use for the background areas. I would love a layer cake to play with, too!! Good luck in your race this weekend. Don't think I can make my voice carry the 5000km between us. Oh,I'd love these! I am trying to make your circle coasters, but mine don't have the wow yours do! I have your book. Would love this layer cake to use with your patterns. Fingers crossed! I love your fabric line. Many thanks for the opportunity. i just bought a jelly roll of your fabric. it'd be a lot of fun to combine it with a layer cake! I love your fabrics and would be so happy to have a chance to find these in my mailbox! Thank you to you and Tammy for the chance. I just hope I'm lucky this week! These are so beautiful, thanks! Seriously?? I would love to win the layercake of your fabric!! of course I want it! can't find it in my local stores....yet! I don't live close enough to cheer on the runners, but I'd certainly give a cheer if I received this layer cake!! I have been admiring your new collection at Marmalade, would love to win this and I would easily make the quilt you suggest to be able to cuddle under the colors!! Thank you for the giveaway! Gorgeous fabrics. Thanks for the chance to win. Would love to make a quilt from your fabric! Good luck on Sunday!! Yes, that would make a very colorful quilt, and i just looooove to combine with grey. Thanks Malka. Love these colours with grey! Thanks for the opportunity to win. Hope I win some fabric as international designer fabric is still unavailable in India. 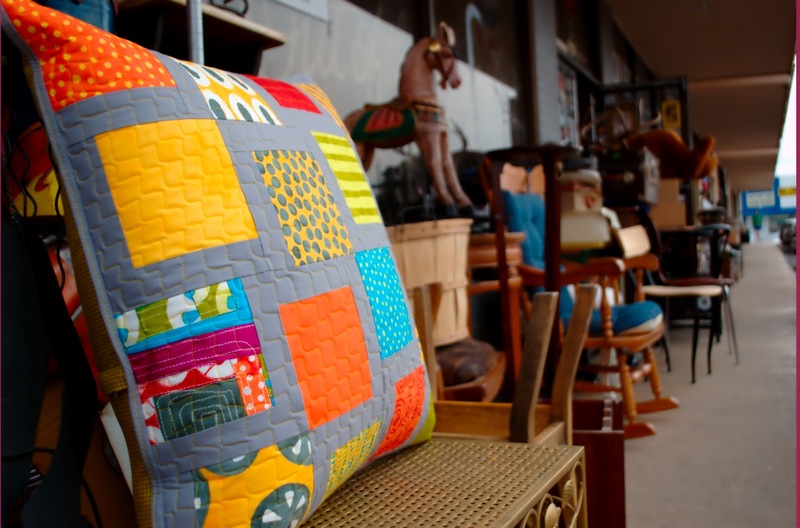 Your cushion is seriously inspiring! Good luck with the running and thanks for the chance to win! Love your new pillow! I already bought fat quarters of your whole line (because I love it so!) but I would be very happy to win more. Hope your race was swift and relatively painless!!! A layer cake for dreary Oregon days! Luck be with me. This fabric would brighten the dull, gray days here! I just love these bright colorful whimsical colors!! And, wow, a layer cake! Please enter me. I wish I was close, but I'd sure love to win this fabulous prize! What fun it would be to craft something so bright and bold! Great giveaway. I'm ready for bright. Good luck on your race. I love the bright colors paired with the gray! A great combo. Even if I don't win, this is one layer cake I'm going to buy! What a generous give away! So many possibilities! Beautiful beautiful fabric! Wow, I had lots of real cake this weekend, so some fabric cake would be great now! I would love to win this. I'm in the process of finding a quilt design to use on my five and three year old's bunk beds with your fabric. The layer cake would allow me to also make some extra cushions. I see there are 199 comments so far.... perhaps number 200 will be lucky for me! How do you spell success? P.U.Z.Z.L.E.